I made this cake as a donation for a child with a heart condition through Icing Smiles. I was told he loves Olaf. 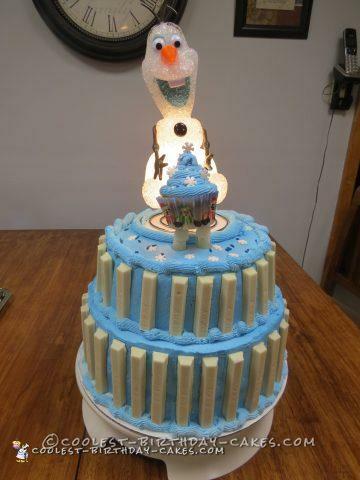 The cake (marble) is 2 10″ rounds and one 8″ round all frosted in blue buttercream. I lined the outside with white Kit Kats. I searched all over for a plastic Olaf for the top but found this cool Olaf light instead. His little arms were just begging for me to insert a cupcake into them. I did have to prop the cupcake up so I used white gum drops with a skewer inside them and it did the trick. I was worried about the cord on the backside of the Olaf but to my luck I was able to use small piece of the Kit Kat candy bar to make a little tunnel for the cord so it is not touching the frosting. I finally delivered the cake and got to meet the little guy I made it for. He was so excited over the Olaf I dont think he cared about the actual cake.